I feel like you didn’t get enough of Good Tiger last week. So, I got you all a gift! This one’s for all you drum sluts out there. 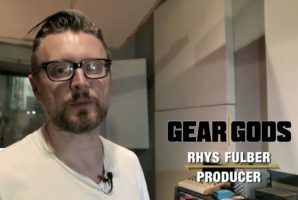 Good Tiger drummer/YouTube sensation/guy who’s too damn good Alex ‘Rudy’ Rudinger gave a quick rundown of the kit he used on the new Good Tiger album We Will All Be Gone. It’s a fairly simple kit, but the way Alex uses it is always a joy to watch and listen to. I always like to try to learn one new from these sorts of videos, and this time I learned that drum shoes were a thing. Who knew! Drummers probably, actually. Good Tiger’s We Will All Be Gone is out now, find it on there website. They’re coming across the ol’ pond for a headlining U.S. tour with Icarus the Owl and Megosh. Dates on Face(book).